A side of crispy bacon sits next to your plate of scrambled eggs. Crumbled pieces of bacon add crunch to everything from salads to ice cream sundaes. Don’t forget about the salty addition of bacon to the perfect hamburger. No matter how you serve your bacon, the popularity of this pork product is gaining in the U.S., to the point bacon festivals are sprouting up everywhere. For the beginner, learning how to cook a perfect strip of bacon involves finding the balance between a soggy, greasy mess and a charred strip of meat. Turn your oven on to the high broil setting. Place a stainless steel grate inside a baking sheet. This raises the bacon and allows grease to drip. Place strips of bacon on the grate so that they do not overlap or touch each other. Place the pan into the oven and let cook for 4 minutes. With an oven mitt, remove the pan from the oven. 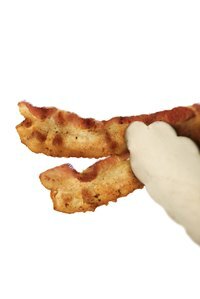 Flip each piece of bacon with tongs. Return the pan to the oven and cook for an additional 4 minutes. Fold two or three pieces of paper towel, and place on a plate. Remove the pan from the oven and, with the tongs, place each piece of bacon onto the paper towel to drain remaining grease. Preheat oven to 375 degrees. Line a baking sheet with foil or parchment paper. This allows for easier cleanup after the bacon cooks. Place bacon pieces on the pan, ensuring each piece does not touch. Place the pan in the oven and cook for 15 to 20 minutes. Cooking is complete when you notice small bubbles on the bacon surface and it is a brown color. Thicker bacon requires the longer cooking time while thin bacon finishes in 15 minutes. Place two or three sheets of paper towel on a plate. Remove the pan from the oven and, using tongs, place each piece of bacon on the paper towel to remove excess grease. Place your frying pan on the burner but do not turn the burner on. Line the frying pan with your bacon strips, trying not to overlap. Turn your burner on low to begin cooking. As the bacon begins to bubble and curl, use the tongs to flip each piece of bacon. Continue to cook and flip until both sides of the bacon are a golden brown. The bacon may still be flimsy, but bacon continues to cook once it is removed from the heat and will become crispy. Remove the bacon from the pan and place on a plate with paper towel to drain the grease. The use of foil or parchment paper in the baking method allows for easy cleanup. Simply let the grease cool, gather up the corners of the foil or parchment and throw away.